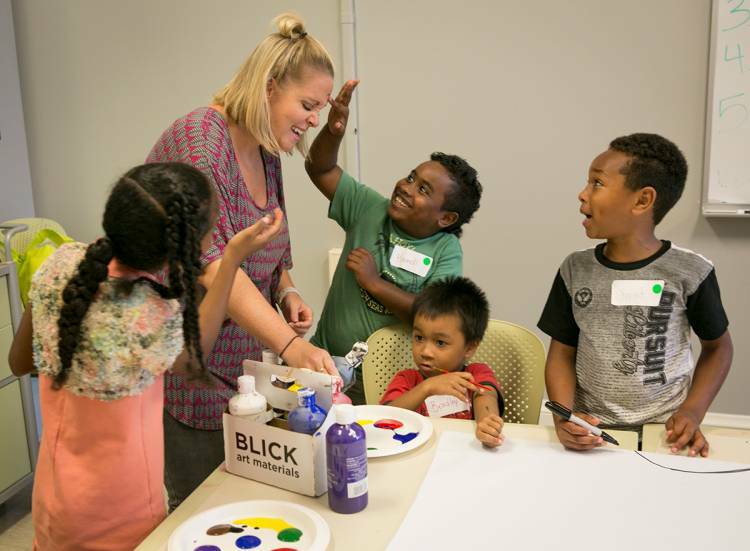 At the end of the summer, the Kenan Institute for Ethics, in collaboration with Art Therapy Institute of North Carolina, hosted its first art therapy camp for youths ages 4-14 from local refugee families. Evidence from other week-long art therapy camps shows that participants experience reduced stress and anxiety and overall improvements to their well-being. The children — originally from from countries including Afghanistan, Vietnam, Iraq, Sudan and Syria, and now relocated in Durham — painted, created super-hero costumes, danced, played outside, and had typical summer camp fun. “The reason why (the arts camp) is effective is it provides a space for kids to express themselves and it also provides a way for them to learn to handle difficult tasks,” says Tra Tran, a graduate student in global health and research graduate fellow at Kenan, whose work with the camp is part of her thesis. Read the Duke News story about the arts camp and watch the video!